Why is mobile the future? Discussion in 'Websites, SEO, SEM, Display, Social, Marketing' started by Alex Snyder, Apr 15, 2010. I watched Steve Jobs' iPhone 4.0 presentation. He's at risk of becoming a caricature of himself. Every feature is described with superlatives, as if a plumber lifted the back of the commode, delineated the inner-workings and pronounced them not only revolutionary, but emotionally satisfying, decreeing that users would truly love the operation of the toilet. Except for a few jokes when he put up fake ads to demonstrate iAd, Jobs was so serious as to establish a divide between himself and his audience. And this is death in the Internet age, if you're not willing to come down off your pedestal and ingratiate yourself with the hoi polloi, you're at risk of ridicule. But that does not mean the content of Steve's presentation was worthless. Watch how they integrate multitasking into the iPhone. It truly transcends any previous implementation. Makes so much sense, is so simple, that only Apple could come up with it. Which begs the question why the iPad is such a better e-reading device than the Kindle. We can argue backlit or not, but usability is far superior on the iPad, controls are intuitive and progress is put forth in pages, unlike the mystifying percentages on the Kindle. Just like the iPod killed the Rio and other MP3 players, the iPad has triumphed over all e-readers overnight. Maybe the lesson is that Amazon should not have ventured out of its area of expertise, not gone into hardware, which requires software to run, but isn't he who's first supposed to triumph in tech? Guess not. And now that's what's happening in mobile. Palm is on its last legs. It may never be sold, or be auctioned off for peanuts, like BeOS or the other game-changers of yore that never managed to get into the fast lane and died. Windows Mobile is losing momentum. RIM does e-mail incredibly well in an era where users demand much more than that. And the iPhone, although not first in the market, is triumphing. In the keynote, Jobs flashed a graphic showing mobile browser usage. 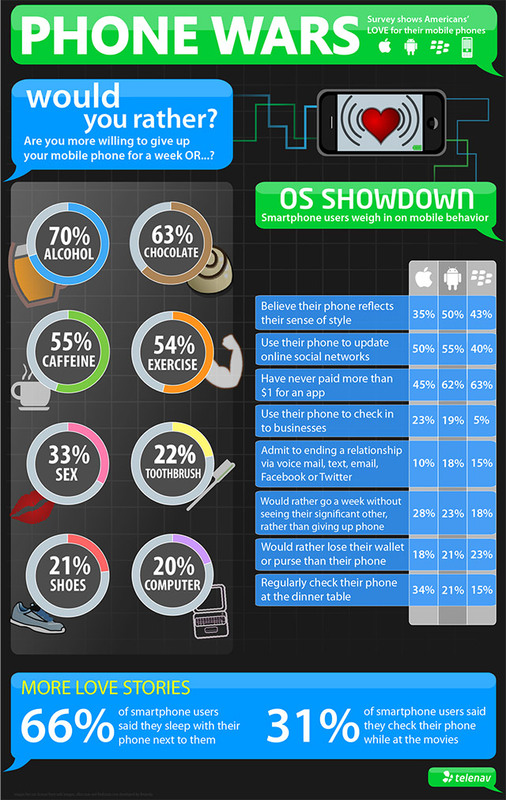 iPhone had 64%, Android 19%, BlackBerry 9% and others 8%. This is staggering. Or, should I ask, do you know anyone who surfs the Web regularly on their BlackBerry? I own one. Navigation is difficult. I go to the usual sites, unless I'm looking up statistics or other raw facts. Browsing is unintuitive and difficult. But on an iPhone, although you might be hindered by AT&T's network, it's similar to the desktop and easy. And he who owns online browsing wins? "By the end of 2011, Mr. Munster said, nearly 50 percent of Apple's total revenue will come from sales of the iPhone and iPod Touch. In 2001, 80 percent of Apple's revenue was from its line of Mac laptops and desktop computers. That figure will slip to about 27 percent in 2011, he said." In other words, just like laptops killed desktops, mobile is about to kill laptops. Not completely, but significantly. Apple's positioning itself for the future. It's battling on fronts the hoi polloi cannot comprehend. Not only is there iAd, which posits that search will be done through apps, a market Apple dominates, but there's the evisceration of Flash and Apple's restrictions on developers, detailing what software can be used to write for the iPhone. In other words, Apple has got its eyes on the future and is remodeling its entire business accordingly, doing its best to maintain the company's momentum while fending off challenges from competitors that are yet to develop. Contrast this with a music business where the usual suspects are still trying to get the public to buy CDs. Universal trumpets ten dollar retail on physical product while iTunes sales flatten and there's no reasonable mobile strategy. If anybody's winning in mobile music, it's Tim Westergren and Pandora, whose growth rate almost doubled overnight with the launch of the company's iPhone app, they're adding 30,000 new listeners a day. Good for music, even better for Pandora. But what about music on demand on mobile handsets? You'd think rights holders would be driving utilization on mobile platforms. Spotify's not free on the iPhone. Why not authorize that right away? And there's a Rhapsody app and MOG's got one in development and this is where customers are going to go if the rights holders help them. The worst case scenario is sideloading. Letting people transfer their collections to their handsets by synching with their computers. Now is the time for people to see the desirability of having the entire history of music at their fingertips, and getting them to pay for it. We don't want people streaming what they already own via the cloud on their handsets, we want everybody with a subscription, paying a little for a lot. But this would require forward thinking. This would require a change of focus from today to tomorrow. Tomorrow is coming. And right now, it looks like all the excitement is in non-music apps. Mobile is the future, especially in developing countries, now's the time to create a winning strategy, one that gets all music to everybody for a low price. I have a feeling Android will continue to gain marketshare and be the iPhone's biggest competitor. The iPhone can now multitask in 2010? The Droid started off there - along with the 5 MegaPixel phone, DVD-quality video, built-in GPS navigation, and tons of other intuitive features. IMO Droid will outpace iPhone in the future. Great summary Alex. You're clearly in the wrong business. You should be heading up corporate strategy for Apple. If Apple and Verizon could get each other drunk and hook up, I'd be a happy camper. Alex, are you saying that you wrote out this post on your iphone? No, I didn't write it. The Seth Godin of the music industry did. Sorry if anyone thought I was on his level - I'm not. I'm also sorry if people are taking this as an Apple ad - it isn't. It is a cry out for developers to pull their heads out of the sand and start coding mobile apps. Forget mobile websites. He is saying that Apple is defining mobile and whatever Apple is doing will be the future. In my opinion, Apple is the king right now. Will they always hold that title? Probably not. But today and for some time tomorrow they certainly will. Be interesting to see if Google pisses them off enough for Apple to launch a search engine. I don't know if I'd like to see that fight. I agree this is the future, Its just easier to access content and the web with something that fits in your pocket. And Apple is defiantly ahead of the game with iTunes and Apps. Also did you guys see the new advertising platform for apps? Looks awesome it's almost like mini apps within an app. This will open up a whole new way to advertise that's actually engaging to the user. Just want to point out Blackberry still owns the SmartPhone market, seems like people forget that sometimes. How quickly this changed in such a short time. It is like dÃ©jÃ vu all over again. In the 80's, Apple had a superior OS and GUI, but it only worked on their closed architecture. Microsoft came in behind them with their Windows GUI and DOS that would work on any "IBM" compatible platform, and Apple almost went the way of Commodore. Here we are again, almost 20 years later, and Apple has a superior OS that only works on their closed architecture, while Google has come in behind them with an open platform OS. I guess we will just have to wait and see if history repeats itself? "..who would’ve guessed that smartphone users had worse manners than their cellphone counterparts, with 26% of smartphone users frequently pulling out their handset at the dinner table, compared with 6% of cellphone users?"